If you’re living under the assumption that Waterloo is just a big fat railway station – you’re sorely misguided. Just a few steps from the monster transport hub you’ll find The Cut and Lower Marsh, a vibrant area packed with world-class theatre, quirky shops and global cuisine. Home to a range of restaurants and businesses, The Cut is the road linking Waterloo and Southwark stations. The street grew into the busy commercial thoroughfare it is today with the coming of the railways in the 19th century, when it was knowns at the New Cut. In those days, it was the site of an extended street market that you’d visit at your peril. Among the gin shops and street vendors, selling all types of dubious wares, was the boxing club where the rules of the sport were reputed to have been first recorded. Perhaps The Cut’s biggest claim to fame today are the two critically-acclaimed theatres; the Old Vic, and it’s more experimental cousin, The Young Vic. The 200-year-old Old Vic promises theatre that’s both entertaining and unpredictable. This season’s Christmas show sees actor Stephen Tompkinson play Scrooge in A Christmas Carol – until 19 January 2019. The spring 2019 programme includes two plays by giant of American drama, Arthur Miller, including a production of All My Sons starring Hollywood legends Sally Field and Bill Pullman. The Young Vic offers a diverse and exciting programme, with many of its hit productions transferring to the West End. Marvel fans can currently catch the rich and gripping drama, The Convert written by Black Panther star Danai Gurira and starring Letitia Wright from the film. Arrive early for your show and you might squeeze in a £5 cocktail and a bite to eat from The Cut Bar – the theatre’s stylish eatery. For an art scene that’s truly underground, head for The Vaults. Couched nearby, beneath a Waterloo railway arch, this eclectic venue hosts exhibitions, drama and cabaret in its maze of subterranean tunnels – you can even pop in for a daytime life drawing class. Part of the same project is Vaulty Towers – described by Timeout as “Part pub, part theatrical production” this boozer/happening even has its own unconventional pub quiz. Eating out in the area has plenty of options. On The Cut itself, The Anchor and Hope was one of London’s original batch of gastropubs, when it launched in the early 2000s. Since then it’s been serving up consistently excellent modern British fare from an unassuming pub dining room. A frequently changing menu features the likes of seven-hour roast lamb with dauphin potatoes, Cuttlefish ‘Venetian style’ or grilled Dover sole with crab beurre blanc. A warning – the Anchor and Hope doesn’t take bookings so get their early. For fine dining Eastern European-style check out Baltic just off The Cut on Blackfriars Road. This light and airy former coach works promises everything from the pickled fish and dumplings of Poland and Russia to the hearty stews of Hungary, alongside a choice of more than 70 vodkas. Other local options include Spanish tapas at Meson Don Felipe or Turkish meze in the original branch of Tas. Close-by there’s Lower Marsh with a trendy vibe that mixes charity shops and greasy spoons with independent boutiques, vintage stores and some unique bars and cafes. This historic south London street was originally built on marshland and has hosted a market since the 1800s. Today it’s the place to come for a wealth of street food options. There’s a flea market on a Saturday too with stalls selling everything from cakes to vinyl records. When visiting Lower Marsh, get your caffeine fix at Coleman Coffee Roasters in the mod-era inspired Scootercaffé or vegan coffee shop Love & Scandal (recently relocated to nearby York Road). 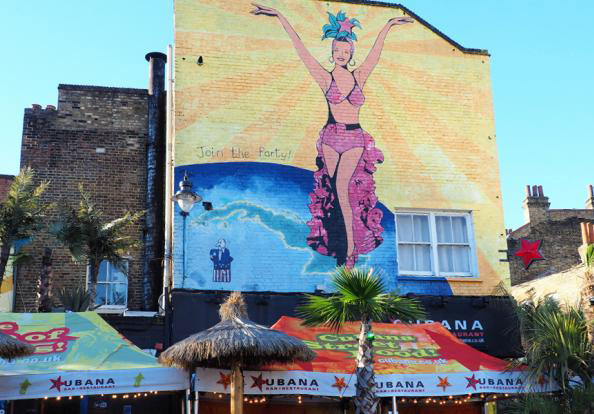 Or check out long-established Latin-themed bar and restaurant Cubana – the self-styled home of mojitos - for cocktails and a highly rated Cuban menu. A good budget option is Marie’s Café servicing Thai curries – as well as English breakfasts. For drinks enjoy a craft beers or prosecco in snug little Café del Marsh or for the more tradition pub environment there’s the Camel and Artichoke. Find out more in our area guides to The Cut, Lower Marsh and Waterloo and if you’re interested in buying or renting in the neighbourhood, we can help – register with us here.